Part of the show Why did a Laser Make My Nuts Glow? This works best on a dry day. 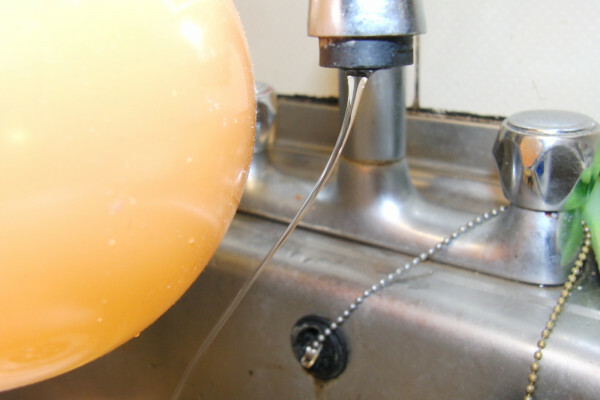 Set the tap running gently so that it has a stream of water coming out. Move the inflated balloon near to the stream of water. Rub the balloon on your hair. Now move the balloon near the stream of water. You should find that the uncharged balloon doesn't affect the stream of water but once you have rubbed it on your head the water is attracted, and attracted more the closer you move the balloon. When you rub the balloon you touch the balloon to your hairs. when this happens a few electrons are transferred from the hair to the balloon. Rubbing repeats this millions of times, leaving the balloon charged. The water starts off neutral, with the same amount of positive and negative charges. When you bring the charged balloon near to the water it pushes electrons away, leaving a positively charged area which is attracted to the balloon. The water coming from the tap is neutral with positive and negative charges. The negatively charged balloon pushes electrons away from the stream of water nearest the balloon, leaving this area slightly positive. This positively charged water is attracted to the balloon so the stream is deflected. A similar effect is used in spray painting, the spray is charged in one direction and the object to be painted is charged the other way, so the paint is attracted to the object, and can even paint the back. Next Bashing balloons - why balloons suddenly stop. I dont think this original explanation is correct...(!) When the water (=water molecules) is running out of the tab, the dipole H2O molecules turn their oxygen(+) side towards the balloon(-) (and the hydrogen(-) atoms point the opposite direction). So this is why the water stream bends because the molecules' plus-sides try to get closer to the balloon's minus-surface. I mean that I dont understand that water's electrons would have anything to do with the bending. But this is only according to my understanding. But the negative ions are pushed away and the positve charges are pulled to the baloon. So, like in a capacitor there is a charge separation. But I dont understand how there is a net movemnt of the whole stream. My hypothasis is that the friction between the water and the pipe caused to the water to be positivly charged, and thus to attract to the negative baloon.